Import the topology of a DataStax Enterprise (DSE) cluster that already exists in OpsCenter and is being monitored in OpsCenter into Lifecycle Manager (LCM) so you can start centrally managing configurations. LCM imports the cluster topology and automatically builds the topology model in the Clusters workspace. If a cluster is not connected to OpsCenter, the cluster is not displayed in LCM and is not available for import. 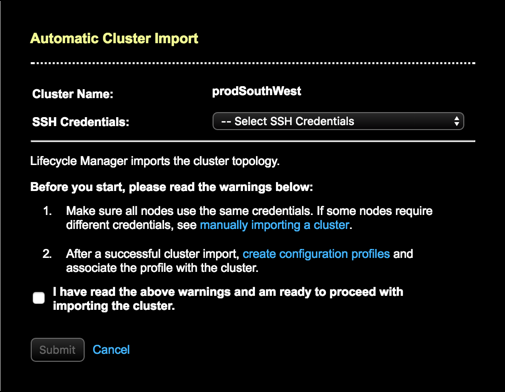 Important: LCM imports cluster topologies only. Configuration profiles are not imported, and must be recreated manually after importing the topology. Additionally, LCM currently only supports importing DSE clusters installed from Debian (.deb) or RedHat (.rpm) packages. Ensure all nodes in the cluster you want to import use the same SSH credentials. If some nodes require different credentials, see manually importing a cluster topology. If nodes do not use the same SSH credentials, you must follow the instructions to manually import the cluster topology.